Please wait a short while because, depending on the size of the files which are being updated, Exiftool may continue working after the Lightroom part of the plug-in appears to have finished. This step is the one that people usually forget and then ask why the plugin isn't working. It's nice to hear from them, and fix the problem so easily, but it is an important step. jb Capture Time to Exif uses Exiftool to write to the files and it is - quite rightly - strict about the syntax of command lines. As shown in the screenshot, you need to enter a "tag name" preceeded by a "-" and followed by "=". Then enter the value in doble quotes. Also avoid non-ASCII characters - my own preference is to avoid all non-alphanumerical characters in metadata. To see an example of the syntax, choose "Sample command line" from the "Preset" drop down box. 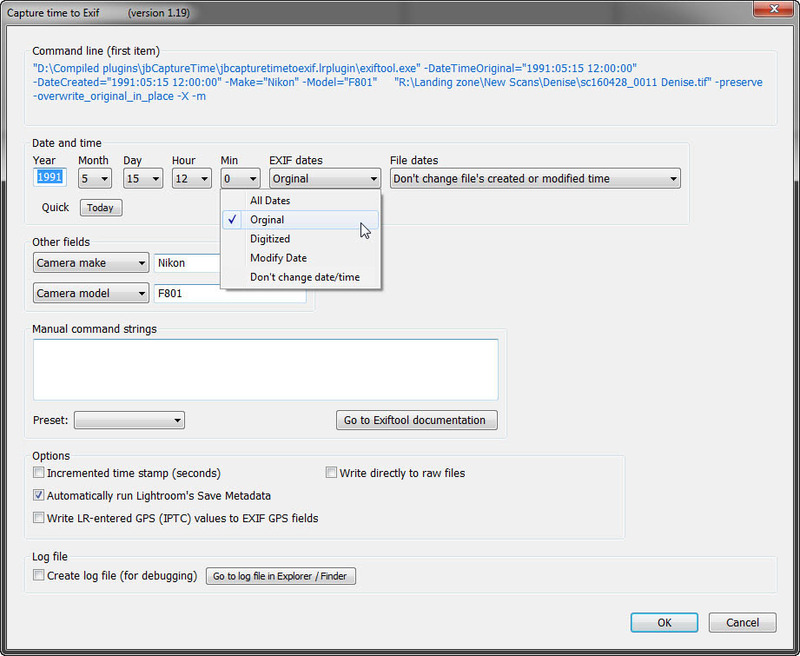 jb Capture Time to Exif can output a log file which contains the command line arguments sent to Exiftool. This can be helpful if the plug-in fails to write a field. Run the plug-in with the "Log" check box ticked. 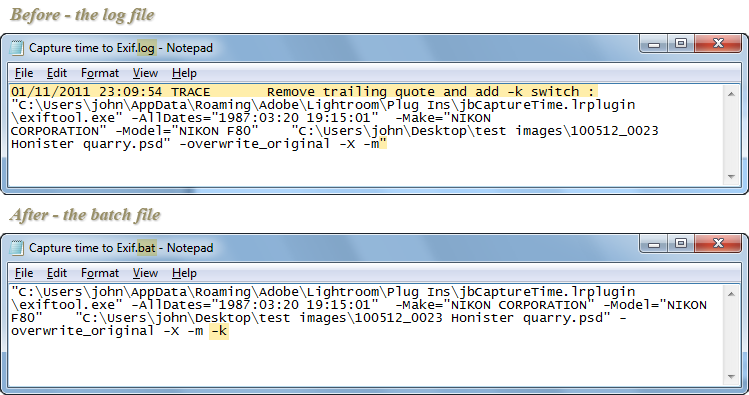 In Notepad or TextEdit, remove the first line from the log file "01/11/2011 23:09:54 TRACE	Remove trailing quote and add -k switch : "
At the end of each line is -m" . Remove the double quote " and add -k, so the end of the line reads -m -k. This -k tells Exiftool not to close when it is finished and is helpful for debugging. In Windows, I change the log file's extension to .bat, and it will then run as a batch file. On Mac I prefer to cut and paste into a Terminal window.